PARKTRONIC is only an aid. It is not a replacement for your attention to your immediate surroundings. 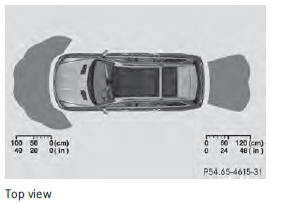 You are always responsible for safe maneuvering, parking and exiting a parking space. 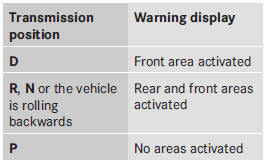 When maneuvering, parking or pulling out of a parking space, make sure that there are no persons, animals or objects in the area in which you are maneuvering. • switch on the ignition • shift the transmission to position D, R or N • release the electric parking brake PARKTRONIC is deactivated at speeds above 11 mph (18km/h). It is reactivated at lower speeds. 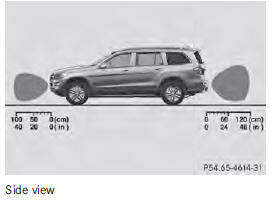 Rabove the detection range, e.g. overhanging loads, truck overhangs or loading ramps. The sensors must be free from dirt, ice or slush. They can otherwise not function correctly. Clean the sensors regularly, taking care not to scratch or damage them . 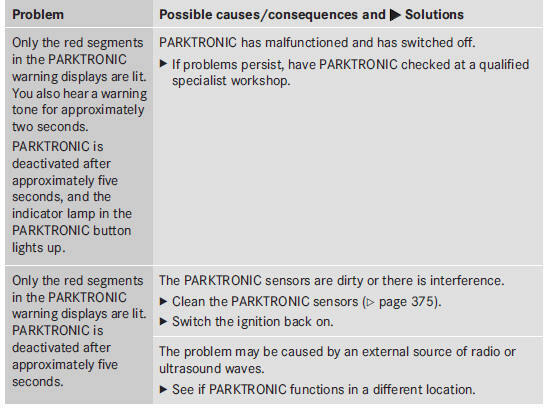 2 Deactivating/activating PARKTRONIC If indicator lamp 1 lights up, PARKTRONIC is deactivated. Active Park Assist is then also deactivated.